This morning a friend was having serious dificulties upgrading his WordPress site from 2.something to 3.0.3. His cry for help reminded me I’ve never actually written a proper rundown on how to do WordPress upgrades the manual way, so on this 15th Day of WordPress that’s what we’ll be looking at. His site, like all of mine, was hosted on 1&1 and he was running into two calssic problems: First WordPress wouldn’t update at all – the process just stalled after the files were downloaded. The second problem – far more complicated – was that the database for his installation was running MySQL 4.something which is too low for the newer versions of WordPress. Quite the conundrum. Well, not really: Just a massive headache. But it’s all fixable. Just so it’s clear: The following information is host independent. I’m just using 1&1 as an example. None of this comes with any warranties of any sort. Mess with your databases and settings at your own risk. I take no responsibility for any disasters here. If you set up your WordPress site a couple of years ago chances are it is still running on a MySQL 4.x database which is no longer supported by WordPress 3.x. In other words, to keep your site safe and get the use of the latest and greatest WordPress has to offer you have to upgrade your database. Some hosting providers will let you automatically upgrade your 4.x database to 5.x, but a lot of them won’t. In other words you have to set up a new 5.x database, dump the old 4.x database and import the dump to your 5.x database, then rewrite your wp-config.php file to access the new one. Tricky, yes, but it’s a necessary evil of running a WordPress site, so let’s get crackin’. This step varies greatly and is entirely dependent on what hosting provider you are using. Usually you go to the MySQL admin area and click “Create new database” or something along those lines. Under 1&1 you go to Administration, MySQL Administration and click New Database. Next you need to get all the content from the old WordPress database so you can add it to the new one. To do this you have to go to phpMyAdmin and do a password dump. The WordPress Codex has a full rundown of how to do this but here’s how to do it on 1&1 if you don’t want to follow the link. The above process will produce a file on your computer that contains your entire WordPress database including all your settings. 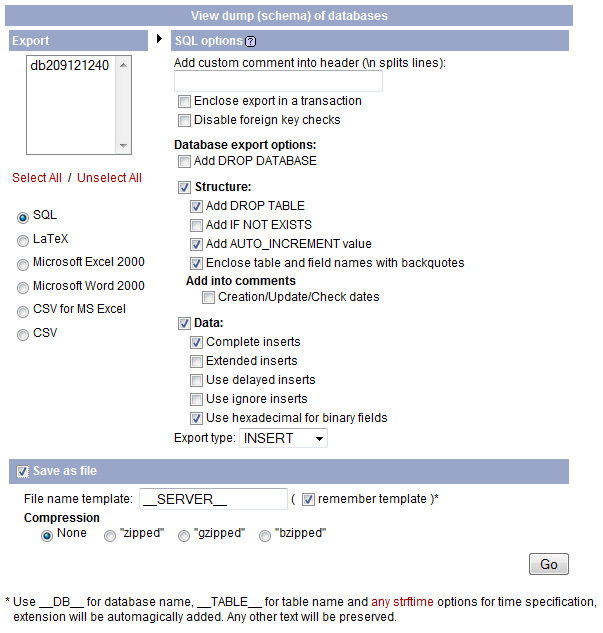 Now you have to move the old database content into the new database. You may or may not encounter a snag here, but I’ll cover that as well. 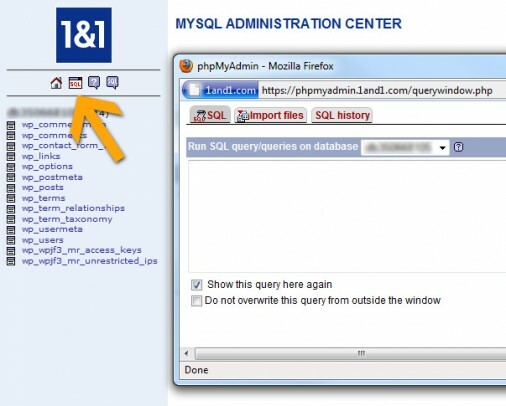 To import the old database dump you first go to phpMyAdmin for your new 5.x database. From here you have to find the import function. As with the export function it’ll be found in different places depending on hosting provider and phpMyAdmin version. On 1&1 it’s located in the Query Window. To get to it click the SQL icon underneat the 1&1 logo and the query window will open (see grab below). In the Query Window you’ll find the Import Files tab. That’s where you want to go. From here import the database file you exported earlier and your database should be populated without any difficulties. Step 3b: I’m getting a SQL error! The sky is falling! If you’re getting this warning it is because phpMyAdmin was a little too smart and added an entry into your backup telling itself to create a new database with the same name when the file was imported. It makes sense in certain cases, but not in ours so we need to get rid of it for everything to work. So, to unconfuse the server simply delete these two lines and try importing the database again. Unless there is some other unknown issue it should work just fine now. If it does, we can move on. If not, call your host and ask for help. With the old database content running on a fresh new 5.x database we can do what we set out to do initially: Upgrade WordPress manually. This is where the comparmentalized nature of WordPress truly shines. You see, you can upgrade WordPress manually by simply deleting all the old files of the installation and replacing them with new ones (with the exception of the wp-content folder – I’ll get to that in a second). Since all your content and configurations is housed in the database, WordPress itself is replaceable. Now the new version of WordPress will talk to your new database. All that’s left is updating WordPress itself. We’ll do this through FTP. Before you follow the next steps make sure you make a backup of the entire wp-content folder on your computer. This folder contains your themes, plugins and all uploaded files (images, music etc). During the upgrade process this folder is off limits. When all the files are uploaded to your host, WordPress should work again. If you visit the front page of your site now it should be working as before. If you try loging in through the backend (www.yoursite.com/wp-admin) you’re likely to get a message that you need to upgrade the database. That’s normal and automatic so just click the upgrade database button. When the upgrade is completed you can log in and everything should be working fine. This tells the server that it is indeed running MySQL 5. I have no idea why this is necessary, but it is. You may already have a .htaccess file with a bunch of content in it on your host. In that case download the file and add the line above to it before uploading it again. This allows WordPress to write to itself and ups the memory limit so automatic upgrades and other functions can run properly. With the .htaccess and php.ini files uploaded to your site everything should finally be working. If it’s not, give your host a call and get them to help you out.